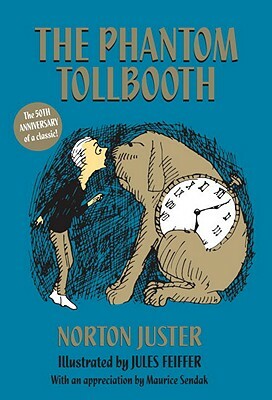 I mention this on the site’s “About” page, but, when I first found out that I was going to be a father, the very next day, I went out and bought a copy of Norton Juster’s The Phantom Tollbooth for my kid – my kid who wasn’t going to be born for another nine months. Why? Because, in many ways, I think it’s the perfect children’s book. Don’t get me wrong. I love Seuss, Silverstein, and Dahl, but there’s just something about the story and the narrative world that Juster puts together in Phantom Tollbooth that just floors me every time I read it. However, while the allusions and puns are fast and furious, they’ve never been my absolute favorite part of the text. For me, The Phantom Tollbooth has, first and foremost, always been about Milo, who, I think, is one of the greatest protagonists in all of children’s literature. The character that Juster creates in Milo is just amazing – we start with this kid who, like so many other children his age, is just bored and can barely muster the energy to do anything. On the first page of the story, Milo tells us that, “[i]t seems to me that almost everything is a waste of time.” (Sadly enough, isn’t that an undeniably universal note to start on? We’ve all been there.) And, as this bored kid gets drawn into this fantastic adventure, we start to witness something amazing. Milo… changes. Maybe you don’t regard “change” as something inherently amazing, but, in children’s lit, there are far too many examples of lead characters that start on one level and stay there for the entirety of the book. Charlie from Charlie and the Chocolate Factory, Lewis Carroll’s Alice, the Pevensie children from Narnia (well, except for Edmund) – they’re all beautifully written, but, as individuals, they don’t really go anywhere. They start good, they remain good, they end good. The stories are the centerpieces of those tales, not the characters. A map of the Lands Beyond, from The Phantom Tollbooth, by Jules Feiffer. Originally appeared in The New York Review of Books. Milo, on the other hand, has this beautiful transformation that Juster orchestrates across Phantom Tollbooth, so, when you reach the end, the reader knows that Milo isn’t the same person we knew at the beginning of the book. And Juster uses his ridiculous rhetoric not only to make us laugh, but also to hit Milo with some very subtle (and beyond clever) observations about the grown-up world. So, regardless of how funny the wordplay is, we know at the end of the book that Milo, without a doubt, understands why you can’t have a Kingdom of Wisdom without Rhyme or Reason. He’s a better person, a smarter person, a more engaged person for having gone through the Phantom Tollbooth and, as readers, we’re better, smarter, and more engaged for having read it. A reviewer once famously commented that “As Pilgrim’s Progress is concerned with the awakening of the sluggardly spirit, The Phantom Tollbooth is concerned with the awakening of the lazy mind.” Which is dead-on accurate. And, with that being the case, can you think of better book to give a child? Fine, fine – is this me gushing over a book? Yes. Definitely yes. This is a book that hit me like a ton of bricks when I was 10 years old and I’ve never fully recovered. (And, thus, this is why it was the inaugural book in my daughter’s library and why it’s the inaugural book on this blog.) I promise, in the future, I will be much, much more cynical about the books I’m covering. However, The Phantom Tollbooth is a different kind of book for me. It wasn’t a book I bought for my daughter because I thought it could teach her the alphabet or make her giggle or lull her to sleep. Rather, it’s a book I bought for her in the hopes that, one day, when she’s ready for it, it’ll be there for her – like the Tollbooth was there for Milo. And maybe she’ll never be ready for it or never respond to it the way that I did, which is totally fine. But, for me, everything The Phantom Tollbooth represents is aspirational – it’s a book I want my daughter to love, it’s a book that wants to challenge its readers, it’s a book where a boy achieves something significant when he learns that the world around him is far, far more interesting that he ever dared hope – and, with that much ambition to spare, I can’t think of a better foundation for a library for my daughter. AUTHOR WEB SITE: Norton Juster doesn’t have an official website (that I can find), but he does Tweet. BUY IT, BORROW IT, OR FORGET IT? : Buy it. For me, this is an instant classic that no home can be without. However, if you were never exposed to Phantom Tollbooth as a kid, you might want to check it out from your local library and see what all the fuss is about. 13 Clocks (1950) by James Thurber, illustrated by Marc Simont – 13 Clocks is one of the only other children’s books that I’ve ever read that even comes close to the linguistic acrobatics that Juster achieved in Tollbooth. Thurber is a master of puns, and 13 Clocks explodes the conventions of the traditional fairy tale in some very, very hilarious ways. While 13 Clocks isn’t as accessible as Tollbooth – particularly due to its lack of a Milo-esque lead – if your kid is a fan of wordplay and language, this book is a must-read. Howl’s Moving Castle (1986) by Diana Wynne Jones – Another masterful YA novel that starts with a bored child and ends beautifully. Jones’ complex fantasy is a fast-paced, often hilarious tale of a young hatter named Sophie, a girl with great magical potential who finds herself transformed into an old woman by the contemptuous Witch of the Waste. The story begins there and spirals off into a myriad of challenging directions, but fans of The Phantom Tollbooth will respect Jones’ sly humor, skill with wordplay, and uniquely fractured take on fairy tales. Funny to read this now as I just started reading this to my second son. My oldest was more than ready for it at 7 but I think I’m putting it aside for the second one for another year (or two). I’ve read it countless times and still delight in every aspect of this delightful tale. This is one of our favorites. We bought a copy when we worked at Borders for our future kids (and so we’d have a copy). Our son was nearly named “Milo.” I love that you started with this one!